it is as well in my family. Especially, my wise allicky sister. she went through the kitchen counting how many times I used it…. it really is not a recipe. Hopefully you never attempted it. You may see under my stencil projects, just how many times you will find it. Go play some eye spy! 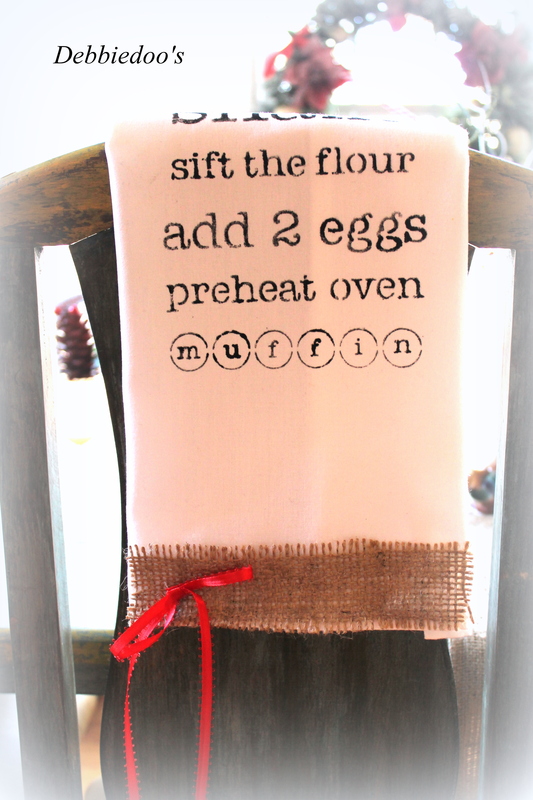 recipe stencil found at Hobby lobby for $2.99…you can get it half off on a sale day. hand made with love gifts, to family and friends. We are saving our dollars for Dublin. Can you believe the mayor of Dublin invited them to march in the St. Patrick’s day Parade? That is a HUGE deal. In fact, probably one of the hugest we will see in a long time. Now back to my diy gifts…. look there is a real recipe? Yes, and a good one..thank you Donna. 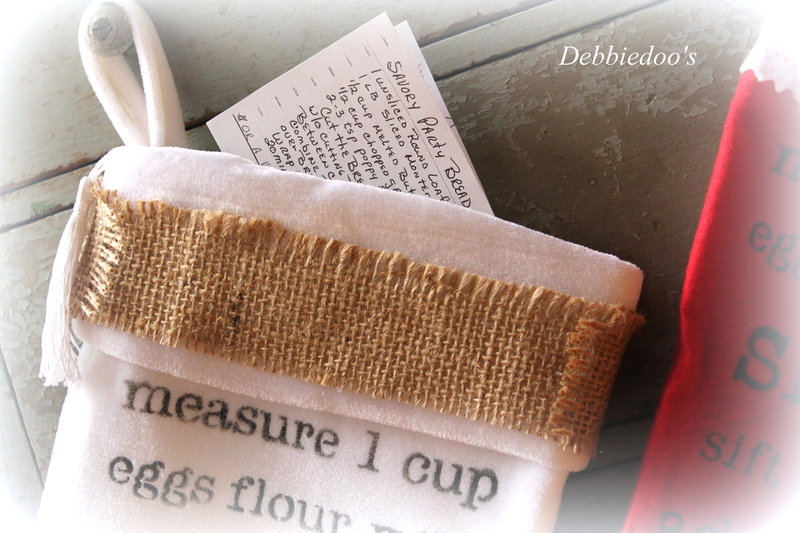 they have a really cute kitchen recipe stocking now. This idea was inspired from an inspired blogging friend Peggy. Peggy does not have a blog, but she is a regular reader of mine. Peggy loved my recipe stencil so much…. that I sent her one of her very own. if she chooses too as I apparently have. This is Peggy’s adorable stocking. I love how she randomly placed the recipe. Did I mention I bought my stockings at the Dollar tree? you may want to check that out for some awesome inspiration on a budget. 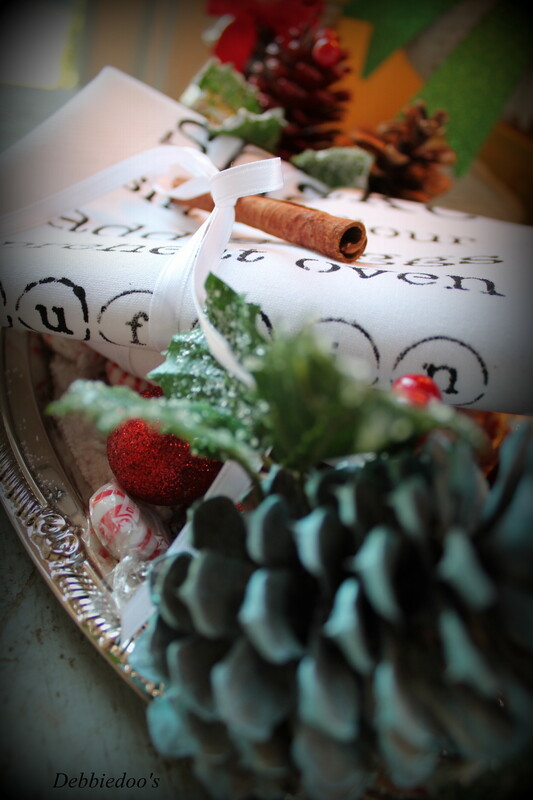 The red stocking needed a cinnamon stick snowflake…don’t you think? This actually is for a friend of mine who loves texture and nature, so I thought this was the perfect embellishment. If you love budget friendly craft ideas you are at the right place. Hope to see you back again, if you are not a regular. You can check out my Dollar tree Holiday archives while you are here. My blogging friend Linda just mentioned she made one in burlap. I do believe this is where Peggy must have seen the inspiration…through one of my bazillion parties. If you are new here, I am also very excited to share my new stencil line with you. 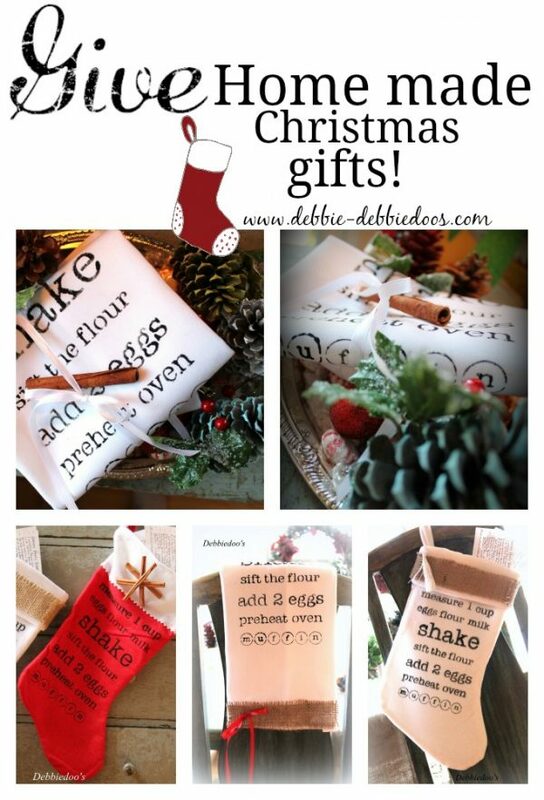 Debbie, I like it made into the stocking, so cute:) Also love the font you used. I bet you will have a wonderful time on your trip. My husband is Irish and we would love to go sometime. Since I’ve been so hit and miss, I must have missed the recipe rather than hit it. It’s all so cute! I’m so excited for you about the trip to Dublin and the ability to march in the most GENUINE St. Patty’s Day parade of them all. I don’t know how I didn’t know you were a band parent. I was too (for one of mine). We never got to do something as wonderful as that though! We love being band Parents. Hoping our little guy follows suit..but he kinda marches to his own band LOL. Thank you Debbie. I love all of these! They are building a Hobby Lobby about a mile away from me, and the minute they open, I am going to find this stencil!!! love that stencil and all the great projects that have been done with it. enjoy every moment of this memory making trip. Love it on the stocking, Debbie! You’ve put together some lovely gifts. I did some handmade gifts myself this year. I’ve been to Ireland once not Dublin but you will love every second of it…I’m so excited for you and your son to march in such an event. Love your DIY gifts! I love those stockings~I’m going to go out today & find the supplies to make them, very clever (: Thanks! The Christmas stockings are so cute! Really cute ideas Debbie. I have that stencil, but it is still clean, like unused. Better get busy with it and make some stockings. With such sadness and heavy hearts, Christmas will be a little less cheerful this year. 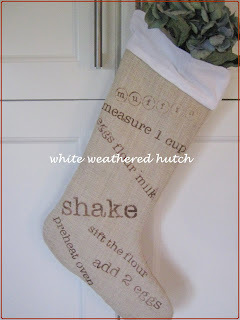 Yes I had made the same stocking in burlap…. Just added yours too Linda:) So cute! I certainly hope if you haven’t already, that you gift your sister with that stencil on something! 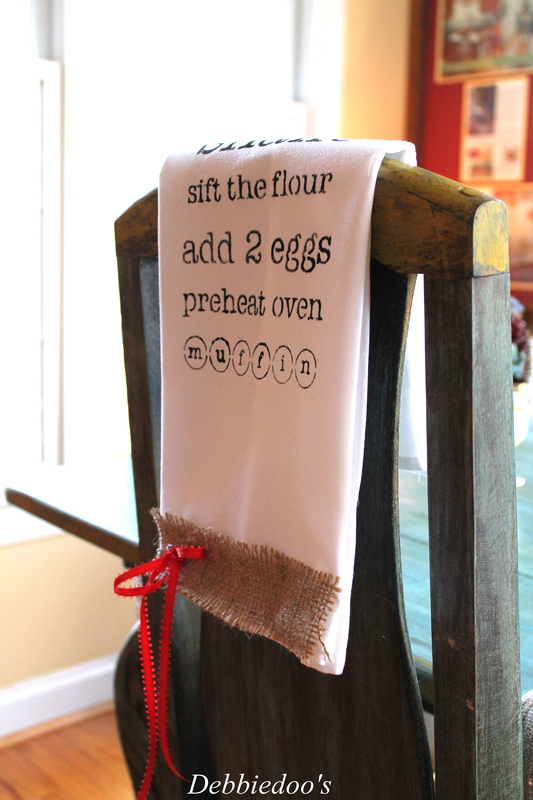 I love all your stenciled projects, and really love the towel! It can be used year round. OhI love this idea. So cute and different and I love how it is lovely on all the different textures. How exciting that you are going to Ireland. It is on my list of places to go someday. As soon as you started talking about a stencil you sue a lot, I knew which one it would be. 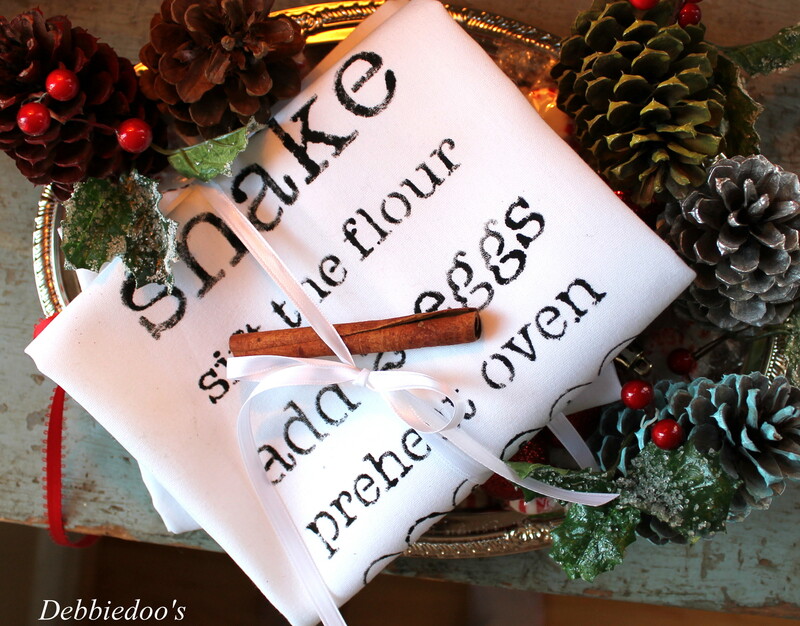 It is very cute and the stocking with recipes makes a great gift idea. That is super cute I love it ! What a fun idea, Debbie! These little stocking are precious… creative… and economical!!! You are the best! I love that stencil Debbie and never get tired of seeing it! LOVE it on that white stocking with the burlap trim! It’s the stencil that keeps on giving. Cute stockings. Cute and clever gift ideas!!! I am so excited for you to be going to Ireland! I would LOVE to go there! I have a friend who recently spent three weeks there with her daughter, and traced their ancestors and visited many relatives! It’s a great stencil when you can get so many projects from it! Dublin sounds so exciting, Debbie! Love your stocking. I, for one, never get tired of your stencil. 🙂 It’s exciting enough to be able to visit Ireland, but then to be invited to march in the St. Patrick’s Day parade, that puts it over the top! Happy Holidays! I love that stencil and how you can use it in so many ways! The stockings are so cute!! I really love the cinnamon stick snowflake..what a great embellishment! Clever clever! You are going to LOVE Ireland! How adorable!!!! 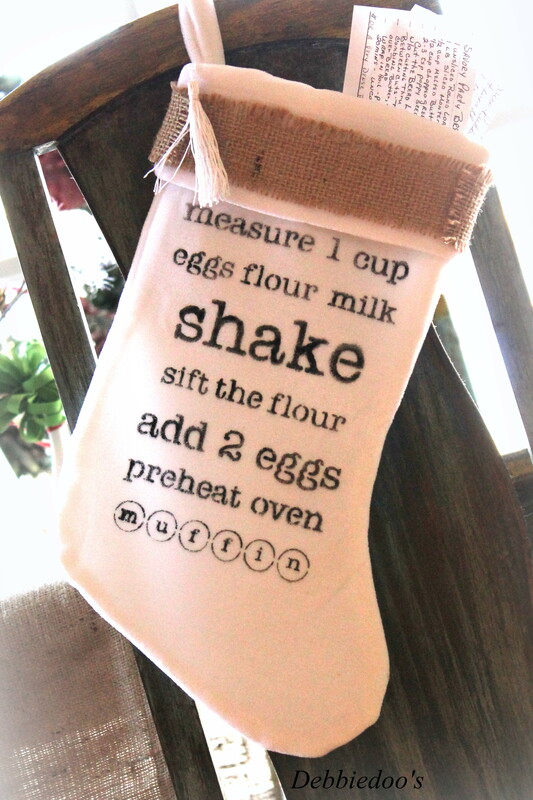 Love the stocking idea, very cute! That would make a great little gift, stuffed with all kinds of goodies! Thanks for sharing! Merry Christmas!